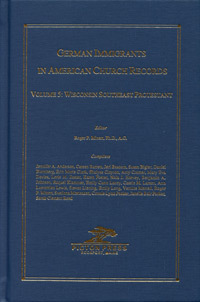 German Immigrants in American Church Records Vol. 5: Wisconsin Southeast Protestant - Roger P. Minert Ph.D., A.G. et al; Autographed book; 21,704-entry Every-name Index; hard cover,; 672 pages; 2008. The volume is unique in that it is autographed, not only by Roger Minert, but by a number of the compilers who helped helped make the book possible. The are only 10 copies available. The book is beautifully bound in a Library-quality binding. It doesn't get better than this. This book is the fifth in a series of compilations of names and personal data of immigrants from Germany found in parish records in various states in the US. The southeast section of the state of Wisconsin was chosen for this fifth volume. Counties included are: Kenosha, Ozaukee, Milwaukee, Racine, Walworth, Washington and Waukesha. "German Genealogy researchers should be overjoyed with Minert's new series. His project is well thought out and carefully implemented by trained assistants. German Immigrants in American Church Records will be a standard in the field for years to come." -Sonia Schoenfield, Illinois State Genealogical Society Quarterly.